Gowlland Tod Provincial Park is situated near Victoria on the east side of a deep fjord called the Finlayson Arm. On the west side is the mountainous section of highway known as the Malahat that connects Victoria to the rest of Vancouver Island. It is in the Coastal Douglas Fir zone, the ecosystem with the lowest percentage area protected in British Columbia. Dry hilltops in the park are home to rare moss and wildflower sites of national significance. Sustainable Trails: The environmental footprint in parks is much associated with trails. Sustainable trails are an important part of protecting natural conditions in a park or protected area.Leading conservation agencies such as the US National Parks place emphasis on sustainable trails to reduce the environmental footprint. A sustainable trail has minimal impact on natural conditions and sensitive sites. 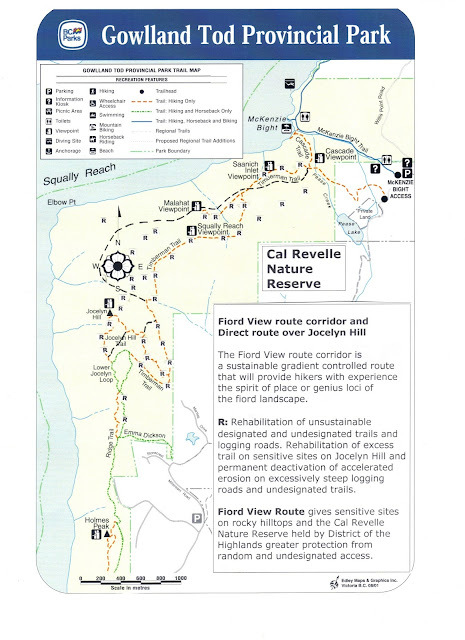 It is free from erosion and provides a safe walking surface as well as views and points of interest that motivates hikers to stay on the trail. Assessment of trail sustainability in Gowlland Tod Park. The Ridge Trail that runs from the south end of the park is sustainable but in need of maintenance. This trail provides users with good viewpoints to the fjord and gives a good appreciation of the landscape. Poor location and strategic routing of the main trails in the park are the source of the problem. This part of the park is also zoned for a higher level of protection so the problems are significant. On Jocelyn Hill the main trails make a big zig-zag and this prompts users to make short cuts and trample over rare moss and wildflower sites. These sites are of national significance and a considerable area has been degraded. Sections of steep trail on the hill are suffering accelerated erosion and this makes them doubly unsustainable and unsafe. The Timberman Trail has poor strategic routing. It follows a somewhat inland route that does not give users good views or appreciation of the fjord landscape. The inland routing also puts it in conflict with rare moss and wildflower sites. Users go onto these open sites in search of views that are not available from the trail. 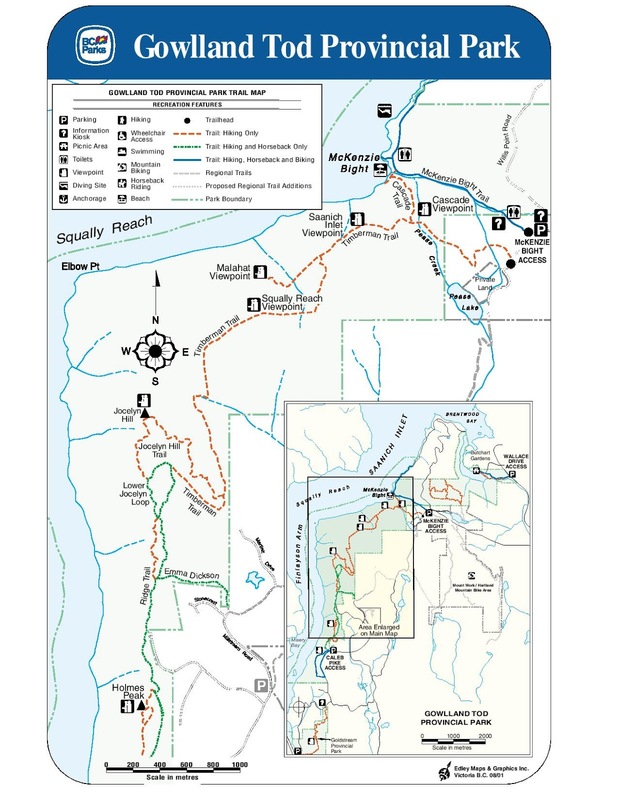 Since the Timberman trail lacks sufficient interest, users have pioneered un-designated trails shown on the map by impact notations. An un-designated trail near the Cal Revelle Nature Reserve held by the District of the Highlands is compromising the objective of no human access in the reserve. To achieve its inland routing the Timberman Trail climbs steeply from the Pease Creek bridge across a very steep slope at excessive gradients upwards of 20%. This section is suffering severe accelerated erosion. The trail is unsafe and gives a white water hiking experience during rain storms. Man caused accelerated erosion is an ongoing environmental disturbance that has no place in a protected area or park. Eroding trails need to be permanently deactivated and rehabilitated. Frequent cross drains are dug across the steep eroding trail. Diverting water flow and removing foot traffic is usually enough to encourage natural rehabilitation and re-vegetation. The unsustainable trail is replaced with a sustainable trail with a reduced gradient of 12% to 15 %. 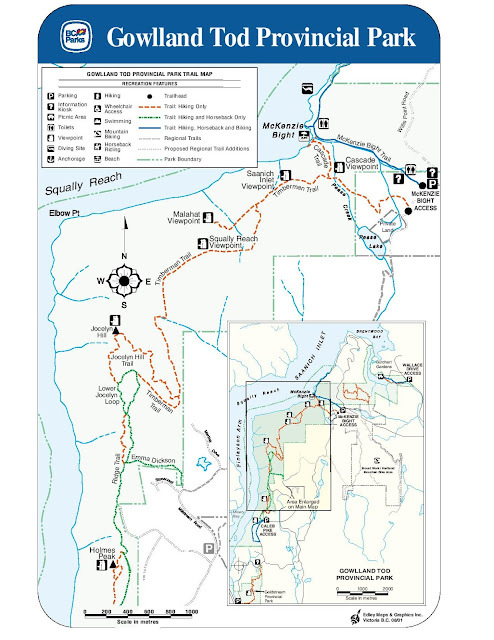 The following map outlines a sustainable rerouting for the Timberman Trail. It meets US National Parks sustainable trail standards and provides users more viewpoints, points of interest and a better appreciation of the fjord landscape. It is a safe sustainable trail. 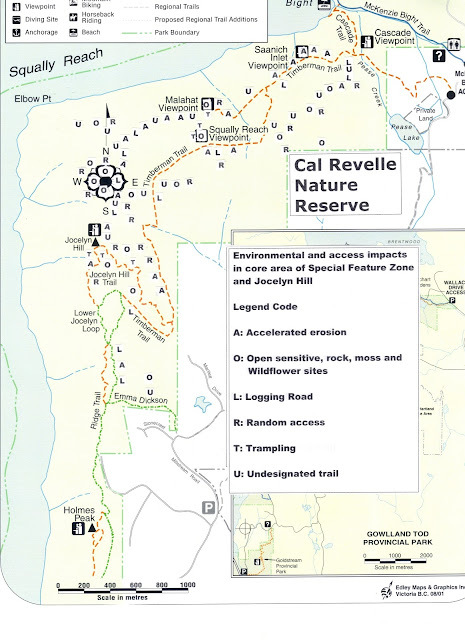 Deactivation and rehabilitation of the existing trails will stop the degradation of natural conditions owing to the impacts outlined on the above map. 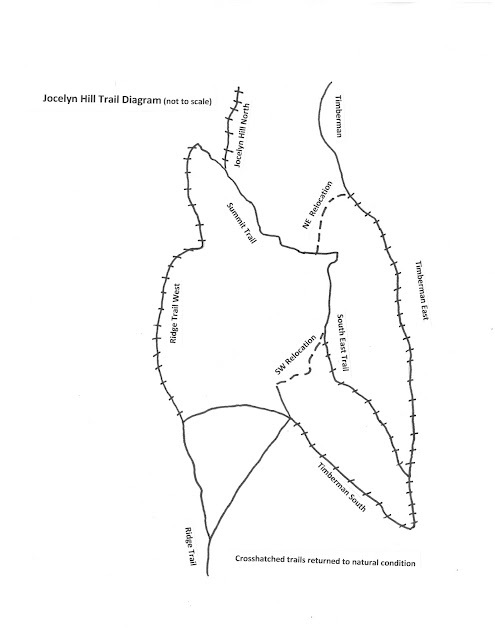 This solution involving a one half kilometer relocation will enable the rehabilitation of almost three kilometers of unsustainable trails from Jocelyn Hill. The more direct route will end the excessive overland trampling that is degrading sensitive sites. Gowlland Tod Park is one of the most sensitive parks in British Columbia. Since it is located near Victoria increasing use is to be expected. The existing unsustainable trail system is degrading natural conditions and compromising the protection of the park. Rehabilitation of the unsustainable trails and construction of the sustainable proposed routes will protect the park and provide users with safe trails with greater interest and appreciation of this unique landscape. Truck Loggers, an organization of forest contractors in British Columbia has been a robust male enclave for most of its history, but it now has a woman president. Jacqui Beban realizes that the economic sustainability of forest contractors is tied to the sustainability of forest dependent communities. The Truck Loggers Association differs from most other forest sector organizations. Most other organizations represent central interests that are headquartered in big cities rather than the hinterland forest communities. Forest dependent communities and forest contractors have felt the pinch in recent years and Jacqui wants to reverse the trend by setting aside the old paradigms and eliminating the box entirely. The box is the legal and institutional framework for the management of public forests in BC. The Truck Loggers have supported the status quo, but now have a leader that wants to eliminate the box to achieve forest contractor sustainability. Forest contractor sustainability is about sustainable forests and also about sharing the wealth that is derived from sustainable forest management. When times get tough, forest contractors are expected to shoulder more than their fair share of austerity, keep welding aging equipment and hope that they can remain solvent. They are at the bottom of any trickle down of surplus wealth from public forests. The box works against forest contractors in many ways. Stewardship of public forests is arranged around rights to harvest public timber held by forest corporations. There two major problems with this arrangement. First, rights to harvest timber are not a sensible foundation for sustainable forest management. Rather, some arrangement based on responsibility for sustainable stewardship is needed to prevent future timber supply problems that result from greed for harvest in the short term. The box is already experiencing these timber supply problems. The box is a central arrangement for disposition of surplus wealth from public forests. The BC Government takes its cut of the surplus in the form of log stumpage charges. In tough times,the government reduces its take to buffer the surplus wealth taken in in the form of forest corporation profits. This buffering does not extend to the forest contractor. The buffering arrangements of government administered timber prices is viewed by trading partner countries as a subsidy and the the forest contractor can get further squeezed by the negative impacts of lumber export duties, tariffs and taxes. To eliminate the box, Jacqui Beban will need to encourage her members to an about face that sees the Truck Loggers become an advocate for new legal and institutional arrangements that devolve responsibility for forest stewardship from central BC Government to communities. It will mean an end to harvesting rights and progress toward local institutions that are entrusted with long term sustainable stewardship of forest resources. The Truck Loggers have been progressive in encouraging First Nations participation in forestry employment. Aboriginal title has been defined by the Supreme Court of Canada as a community trust to ensure the sustainability of natural resources for present and future generations. The inside the box thinking is that First Nations will exercise this stewardship by consultation with the existing framework for resource allocation, such as harvesting rights in public forests. Aboriginal title needs its own institution to ensure sustainability. Responsibility for stewardship needs to be devolved from the Province to a trust that has registered professional managers and an elected board. The same arrangement could apply to forest dependent communities through the formation of local forest trusts. A Forest Practices Board report on District Manager's Authority questions self regulation by forest companies under the concept of professional reliance. Use link to get to the Forest Practices Board Reports. Recently,Canada has had a change in Government and the governing Liberal Party promised some form of proportional representation. This is also supported by the New Democratic Party and the Green Party. There are several forms of proportional representation and any form that Canada selects may pose a problem for Canada's environment. Even the present first past the post method of representation carries the same problem. When we talk of proportional representation, we mean proportional to the population that live mainly in cities strung across the south of Canada. About half of Canada's population live in a few big cities. Our larger cities tend to be ports, transportation, supply, financial, and political centers for a economy that is based on natural resources usually located in the hinterland. Canada's forests are a major carbon sink or repository for the world. Our forest laws and policies for forests that tend to be public rather than private have favored grand scale timber supply that favor the business of the big city while ignoring the sustainability of individual forest dependent communities. Proportional representation will not solve the problem of big cities depleting the hinterland. The power of cities is reflected in our culture. Before 1900 the average person would have understood the meaning of character, but the notion of personality would be new and little understood. The notion of personality, style, merits of extrovert behavior, celebrity increased through the 20th century as cities grew and became centers for new technology and media. The growth of cities has had a profound effect on human culture. Are these changes in our culture and perspectives good for our relationship with the land and nature outside our built cities? Will our children that are heavily occupied looking at the screens of various electronic devices have a feel for the farm or forest? Will the votes from the city ever represent Canada? Proportional representation in Canada needs to include some mechanism that is proportional to the area of Canada. Canada is a vast country and our different regions, areas and environments need representation. There are cultural differences within Canada that are a product of regional environments. Our founding fathers saw the Canadian Senate as the representative of different areas. Western Canada was barely in the picture at that time, and the non elected appointee Senate has declined in stature as a credible institution. Canada is a tenuous country and a reformed elected senate that represents areas or regions could help to hold the country together in the long term. While there is considerable support for proportional representation, our politicians are unwilling to tackle proportional representation of regions or areas because it will involve the Provinces and constitutional reform. Too difficult the politicians say. Are our politicians being too lazy. An elected Senate could improve the long term stability of our tenuous country. Provinces in Canada have considerable powers, more than most federal systems. The flow of natural resources from the hinterland is what makes the big cities, financial and political centers of Provinces tick. A major pipeline intended to move Alberta oil or bitumen south to the Gulf of Mexico has been denied by USA. If Canada or the other provinces restricts the flow of Alberta oil to the east or west, Alberta will have the motivation to leave the Canadian federation. Canada needs some representation proportional to area in Ottawa. A reformed elected Senate could be the necessary institution. Such a Senate would represent the land and the natural environment and ensure that our political system is not dominated by voices from the built environments of the city. British Columbia's public forests are managed through a system of private timber harvesting rights. Industrial timber production takes priority and sustaining other values is seen as an imposition on timber activities. After a binge through the best virgin timber in the last half of last century, the forest sector is less robust and more sensitive to cost pressures and unlikely to be progressive in the stewardship of non-timber values and resources. The Montreal Process an international agreement makes it clear that sustainable forest management means including non timber and nature based economic activities in the forest economy. Only approximately 25% of the average public forest landscape in BC is suitable for timber production. The remaining 75% is wilderness in natural condition with considerable recreation potential. This area of wilderness is twice as large as the area protected in parks. The wilderness areas in timber producing forest landscapes and the protected areas in BC Parks are lands in natural condition with recreational potential. Land in natural virgin condition is in short supply in the world. BC has barely scratched the surface of the sustainable nature based economy that could be generated from these lands that make up more than half the area of the Province. Aesthetic values have been reduced in some areas as a result of industrial timber management. The Montreal Process calls for legal and institutional arrangements that support comprehensive sustainable forest management. Given that the recent mountain pine beetle epidemic was, in large part, a $100 Billion forest management failure, it can be argued that the timber harvesting rights system has failed to ensure timber sustainability. It has done a poor job of managing other values and made our forest products vulnerable to discriminatory export duties. British Columbia's potential for non-comsumptive nature based economic activity is greater than Switzerland. Switzerland's tourist economy is valued at US $20 Billion. This is larger than BC's forest economy. BC's private harvesting rights in public forests impedes the development of nature based resources and economic activity. BC Parks, the management authority for protected areas is unfunded and lacking professional capacity. Development of forest recreation resources should be sustainable. While other jurisdictions have standards for safe sustainable forest trails, poorly located unsustainable trails are the rule rather than the exception in BC. Serious accelerated erosion can be found on trails in BC Parks. New legal and institutional arrangements are required for sustainable management of public forests in BC. These arrangements should focus on stewardship responsibility rather than private rights. The stewardship institution should have the mandate to manage all the natural capital of a forest landscape. The stewardship institution should be accountable to the local public. The local forest trust is a promising forest stewardship institution. Trusteeship of public forests would be devolved from the BC Government and would replace the existing failed institutions. The local forest trust would have a democratically elected board and professional forest managers charged with sustainable management of all forest resources. The forest managers would contract harvesting operations and sell the timber on an open market. They would also be responsible for the protection and development of recreation and other resources. Recreation business activity could take place through stewardship licenses. A more long term forest design approach would be employed to sustain all forest values and there would be a major shift away from the present short term piecemeal planning that is associated with forest harvesting and its grudging accommodation of other interests. Forestry treatments would become more diverse and as a result the health, aesthetics and timber sustainability of the forest landscape will improve. British Columbia's public forests are managed by harvesting rights that are held by forest companies. The public interest in recreation is handled through professional reliance. Professional foresters are supposed to ensure that environmental and recreational values are sustained and protected in any forest management plans. Most forest professionals probably do their best to accommodate other forest values and interests. However, the entire legal and institutional framework for managing public forests is stacked against a more proactive approach toward the development and protection of recreational resources. Timber is king in BC's forests and this false economic hegemony has pushed other interests to the side because they are not seen as producing big dollars. The tourism economy in BC is significant and could be much enhanced by some investment and development in forest recreation. Forest companies with timber harvesting rights operate on timber dollars and accommodating other interests and values is viewed as an imposition or a constraint on timber activities. Professional foresters are hired or employed by forest companies and are subject to the pressures to reduce timber harvesting and forest operating costs. The timber harvesting binge through the best of BC's virgin timber in the last half of last century has left a situation where forest operating cost pressures are greater than any time in the last seventy five years. Cost pressures are likely to impede progress in stewardship of non-timber values. Where does recreation and tourism fit in sustainable forest management? This depends on your definition of sustainable forest management. Sustainable forest management is touted by the BC Government and forest corporations. Some of the sustainable forest management certification schemes have a timber centric definition of sustainable forest management with other interests being accommodated by advisory groups and public opportunities to comment. These align with the approach of the BC Government and forest corporations toward the management of other forest values and interests. Public involvement processes can easily become a public relations effort to appease the public with no real commitment, dollars or effort going into the protection development and enhancement of non-timber resources or values. The Montreal Process, an international agreement and definition of sustainable forest management signed by Canada makes it clear that recreation and tourism does fit within sustainable forest management. Sustainable forest management is about generating multiple social and economic benefits to meet the needs of forest dependent communities. Sustainable forest management is about generating economic value from timber and then adding other social and economic benefits from the natural capital of the forest landscape. Further, the Montreal Process makes it clear that a forest jurisdiction such as the Province of British Columbia should have a legal and institutional framework that enables the type of comprehensive sustainable forest management that it defines. The potential for forest recreation and associated nature based economic activity in British Columbia is an untapped major economic opportunity. Switzerland's mountains, forests and scenery attracts a tourism economy of US$ 20 Billion annually (more than our timber economy). BC has more to offer and greater potential. A forest dependent community seeking to enhance its tourism economy by developing the recreational potential of its forest landscapes will be impeded rather than aided by the institutional framework for forest management. A forest company or forest company will see the landscape as its operating forest and the proposed recreational developments as a bit of a nuisance. Politicians, especially at times of elections invite us all to partake in a sort of voluntary tyranny of the economy. The economy looms so large that it distorts our perceptions. Our perception of the average public forest landscape has been similarly distorted. Timber economics looms large and most of us see timber growing and harvesting as the dominant feature of the landscape. Only about one quarter of the area of the average forest landscape in BC is suitable for timber production. The remainder of the area is inaccessible or uneconomic forest, alpine areas, lakes glaciers and mountain tops that will remain in wild natural condition. This area of de-facto parks is about twice the area of our officially designated protected areas or parks. The last two decades have seen a considerable increase in the area of public forest that has been placed in parks or protected areas. Pressure from environmental groups to "save" forests from forest management was the motivating force for designating more parks. Society was seen to have made an economic sacrifice and there were calls from the forest sector to designate timber producing forests as "working forests" or places where growing timber could take place without the constraints of other interests or values. Polarized political land use and economic arguments between environmentalists and forest corporate interests have distorted our perceptions of the real need to provide sustainable stewardship to forest landscapes. These perceptions have emanated from big cities and are being imposed to the detriment of forest dependent communities. The polarized debate over forest management did promote improvement in forest practices. Erosion associated with forest roads in timber producing forests was much reduced. Meanwhile there is egregious soil erosion ongoing on trails in "saved" forests or protected areas because BC Parks lacks similar standards, budget and trained staff capacity. The area that comprises BC's forest recreational resource, the protected areas or parks and the land that will remain in natural condition within timber producing forest landscape is getting little stewardship under our existing framework. Meanwhile there is pressure toward a timber producing or "working forest" approach in the timber producing area. Timber producing areas can also offer considerable recreational opportunity if a long term forest design approach makes accommodations for other values. The present forest stewardship plans are really only relatively short term plans for harvest and forest regeneration with other values seen as a constraint requiring some work around approach. Forest recreation is poorly accommodated within the present framework for managing public forests. Efforts to prop up our existing arrangements, designed for 1945, are likely to be regressive with respect to protecting and developing recreational values. In 1980, the Ministry of Forests had a recreation section with professional capacity in forest recreation. This capacity no longer exists and the cost pressures in forest harvesting have increased. Forest contractors are being squeezed by forest corporations and there is less stability in the forest sector. There may be increased discriminatory tariffs and taxes on forest product exports to USA because their lumber producers can make convincing arguments that the BC framework is not market based and subsidizes forest companies. BC forest products get extra taxes because BC's system is too lenient. The US forest products producers could argue that BC is not doing enough to sustain other values and failing to pay the costs of their protection is a subsidy. Our forest products could face extra taxes because we are not doing enough to sustain recreation and other forest values. The BC Government's revenue stream from stumpage will reduce and this will put pressure to reduce administration costs through long term leasing of public forest land for corporations to have a relatively free hand in mono focused timber growing. The population of BC is becoming more concentrated in southern cities easing the way for politicians to advocate robbing the hinterland for the sake of the economy. Government and forest corporation public relations efforts will point to a future of improvement in the accommodation of recreational values and development in BC's forest landscapes. However, the present situation in the forest sector indicates that we will face a regressive period with regard to the stewardship of recreation and other non-timber forest values. Today, we like to talk about ecosystem forest management. Actually the idea that forests should be managed more along the lines of natural indigenous forests has been around for a long time. Foresters were advocating this approach almost two centuries ago. The main argument was that more natural forests are less likely to have major failures or blips in their ability to sustain timber supplies. "Work with nature or you will be defeated" was the dictum of foresters that opted for the natural approach. BC has just experienced one of the most serious blips in the history of forest management. The mountain pine beetle epidemic caused lost economic opportunity to the tune of about $100 Billion. The public relations machine would have us believe that global warming is the sole culprit. The main species involved is Lodge Pole Pine. European foresters have been growing this BC tree as an exotic species and know it should be harvested before it gets too old. Too old for this species is about 80 years because it becomes susceptible to mountain pine beetle attack at that age. In BC, harvesting other species was favored and government forest fire fighting efforts saved more Lodge Pole pine from fire. The net result was that the interior of BC became filled with old Lodge Pole pine. Our forest management arrangements for public forests created a huge area of prime mountain pine beetle habitat ready and waiting for a mild winter or two. Since BC is on the Pacific shores a couple of mild winters can be expected without help from global warming. Our legal and institutional framework, based on the notion that forests can be sustainably managed by the vehicle of harvesting rights has failed to sustain timber supplies and resulted in major economic losses. It is not good for the timber economy and it has been a major impediment to the protection and development of recreation and the non-timber forest economy. What should we learn from this? In forest ecosystem management we should see ourselves as part to the ecosystem. A major item in how we interact with the forest ecosystem is our legal and institutional arrangements for managing our public forests. The public as owners have given up their forests to a system of private harvesting rights that has had negative impacts on the forest and its timber production capacity while riding roughshod over other forest values. These are ecosystem and public values. We need a new system that works for the forest ecosystem and the public instead of corporate greed. We need to start thinking of our forest values not as a right but as a responsibility. We have to be good stewards of the forest and our legal and institutional arrangements should ensure stewardship. The stewards should not be corporate folk with a right to harvest, but independent professional stewards charged with comprehensive sustainable management of all the natural capital of the forest landscape. These stewards should be accountable to the owners of the forest. In BC the owners are the public. The trustee for the public has been the BC Government and for over a century it has failed to adequately exercise its duty to the public as beneficiaries of our forests and values. Its forest and environmental agencies are failed institutions. Even if you have a warm feeling about the considerable increase in parks or protected areas, the management authority, BC Parks, is perhaps the most capacity and budget deficient of the agencies involved in public forests. A new approach of devolving trusteeship of public forests from the Provincial Government to local forest trusts under trust documents requiring sustainable forest management as defined by the Montreal Process is the a promising arrangement. There would be a locally elected board and professional managers charged with sustaining all forest values. The forest managers would plan and conduct timber operations with the aid of contractors. Timber would be sold on the open market. The forest managers would also be responsible for planning and managing other forest resources. Recreation or nature based economic operations would operate under stewardship licenses. The professional forest managers would work for all interests and would be accountable to the public through a democratically elected board. The local trust approach provides for stewardship of all resources rather than private timber harvesting rights with the hope that the harvesters will accommodate and care for other values. The polarized reaction to industrial timber harvesting activity in British Columbia is a product of the deficiencies or inability of the harvesting rights system to accommodate other values. This has distorted public perception about forest management and stewardship. Forest management should include stewardship of recreational values. The local forest trust approach would provide professional forest stewards that would plan and develop recreational values. A long term forest design approach could be employed rather than simply trying to reduce impacts of piecemeal harvesting plans. The lack of social license for timber harvesting in BC has brought the view that all forest harvest is bad while protection in parks or other non timber activity is good. The reality is that all activity in forests requires good stewardship. Poor forest roads, recreation trails, ski runs can cause erosion. Good stewardship and planning can prevent these problems. Good stewardship is the product of comprehensive education and experience. A forest engineer will have training and experience in forest roads that is transferrable to the task of adequate location and construction of hiking or other trail in the forest. Use of clear cutting, shelter wood or selection silvicultural systems can be used in a forest design to sustain recreation, wildlife or recreational values. Under a new system with professional forest stewards charged with sustaining all forest resources, forest management can be the means to sustain recreational resources. Under the present system of harvesting rights and the hegemony of industrial timber harvesting in the forest landscape there is limited opportunity to exercise the protective potential of good forest stewardship in the protection and development of recreational values. The local forest trust could also be the institution for stewardship of aboriginal title. Aboriginal title is already defined by the Canada's supreme court as a sustainable community title. There is both a social and economic component to the protection and development of recreational values in forests. Nature based economic activity is generated through various diverse recreational activities such a hiking, hunting, guiding, skiing etc. There are social, spiritual, and health benefits in forest recreation. Recreational development in forests to bring significant economic return to a local economy do not need to involve some major project requiring large capital investment. The natural capital is in the natural conditions and scenery in the forest landscape. A good system of hiking trails may be sufficient to supply recreational opportunity to locals and attract visitors and tourists. Sometimes these can be constructed by local volunteers at minimal cost. However, trails need to be adequately routed, located and designed to be sustainable and attract use and tourists. Gradients of trails should not exceed 15% to provide ease of hiking and reduce the risk of erosion. They need to provide viewpoints and other points of interest along the route. Sensitive site should be avoided. The tread or trail surface should be free of tripping hazards such as projecting rocks or roots. Humans are barely evolved to stay upright, and if you hike regularly on a trail with tripping hazards there is a very high chance that you will suffer an injury within one year. A considerable amount of planning and location effort is a prerequisite for a recreational trail system that will be sustainable and attract users and tourists. Other jurisdictions that aim to attract tourists provide high quality hiking trails. Forest trails in BC, even those in protected areas, tend to leave more than a little to be desired. Landscapes that are marred by poorly planned industrial timber operations leave a bad impression on visitors. There are boundless opportunities for recreation in BC's forests but we will not advance in the protection and development of these resources and values until we reform our legal and institutional arrangements for managing public forests. Canada's election campaign is a horse race between Conservatives, Liberals and The New Democratic Party (NDP). The latter two parties are toward the social democratic end of the political spectrum and their splitting of the vote may allow the Conservatives to retain leadership with only approximately 30% of the popular vote. Any party has time to squeeze into the leading position for the vote in about two weeks. All the parties are working hard to attract votes. One of the big issues is transportation infrastructure for commuters in large cities. Eighty percent of Canadians live in cities, so politicians are eager to capture votes from cities. Most of the parties are making some noise about different schemes to reduce carbon emissions. There is also some talk about Canada trying to do more in the way of value adding instead of shipping raw resources out the door for the fastest possible dollar. The NDP have promised some funds to increase forestry jobs but otherwise forests have received little attention in the campaign. Canada is a huge country and no one seems to be asking why most of the population is crowded into southern cities that get so congested that high cost rapid transit is needed. Canada's natural resources are located in the hinterland but these big cities are the financial, supply, transportation or port centers for the resource economy. Many resource dependent communities barely have sidewalks while the cities tend to be better appointed and more attractive to most. Cities that feel entitled and have the votes to exercise their entitlement will continue to be a force toward a " rob the hinterland " type of economy. This outlook has not been good for sustainable stewardship of forests or the most effective use of other natural resources. Canada has a Green party and it is looking to increase its seats in Parliament. Other parties are making green talk about reducing carbon emissions and renewable green energy. Canada's best contribution toward global climate stability is maintaining healthy forests. The largest terrestrial carbon stock on the planet is contained in boreal forests. It is greater than tropical forests and Canada has about 30% of the world's boreal forests. Perhaps the greatest flaw in Canadian democracy is that it represents the people in cities and the greater area of our geography has little place or standing in our system or way of thinking. Canada has an upper house called the Senate. It is a mirror of the House of Lords in the Westminster system of government. It is populated by appointees, mainly political hacks, that relish a good expense account. An elected senate could represent area, the geography of the country and in so doing would give greater voice to Minorities such as First Nations and French speaking people. The Truck Loggers Association has been a force for change in BC forestry. It is a forest contractor association that has been vocal about it's members being financially squeezed by major forest corporations. Their Truck Logger BC magazine contains regular grumbling about this problem and nothing much has changed for their members. Contractors have taken the brunt of recent difficulties in the forest sector. The summer 2015 issue re-frames the issue as one of contractor sustainability. This is probably an effective avenue toward a solution. They draw on definitions from the 1987 Brundtland Commission to support their concept of contractor sustainability. Adequate compensation for work done in the forest enables the contractor to invest in new and innovative equipment and maintain a safe stable work force. This enables efficient forest operations and better environmental protection. The forest and forest dependent communities benefit from stability and sustainability. The Truck Loggers have a winning argument. The Truck Loggers Association view is supported in an international forest sustainability agreement called the Montreal Process. Criterion 6 of that agreement has several indicators that match their views. The "distribution of revenues derived from forest management" is a central concern of Truck Loggers and is the heading of indicator under Criterion 6. While the Montreal Process supports contractor and community stability, it also takes a comprehensive view of all aspects of forest conservation and sustainable forest management. Good stewardship for ensure forest health, productivity, stable soils, good water quality are covered. Truck Loggers will understand that these are vital for contractor sustainability. The final Criterion of the Montreal Process concerns the legal and institutional arrangements that support sustainable forest management. We do not tend to think that these are very important. Also we tend to accept our Provincial arrangements without much question or analysis. British Columbia's Crown forests were retained in public ownership to ensure their sustainable management. The foundation is very strong but some of the structures we have built on top of the foundation were designed for post WWII economic expansion and have since resulted in some sustainability problems. The legal arrangements for managing public forests should involve responsibilities for sustainable stewardship. However, we try to manage forests in BC under rights to harvest. Forest corporations hold or control most of these rights. Forest contractors get squeezed because they are little guys working for the big timber rights holders. Truck Loggers do not want to bite the hand that feeds but they need to realize that without some change in this core issue, their lot will not improve in the future. Aboriginal title is a change agent. We think hat aboriginal title can somehow be absorbed or co-opted under the present arrangements for forest management. Aboriginal title is not compatible with our present arrangements because it is a more advanced concept. It is not an ownership concept but a delegation of responsibility to a community group to sustain the land and forest for the benefit of future generations. Aboriginal title needs its own legal and institutional arrangements. There is the need for some democratic elected board that represents the community and professional resource managers that can plan and manage for sustainability. A local community based sustainable forest trust is much more likely to place priority on contractor sustainability than a large forest corporation. The concept of the community based sustainable trust in Aboriginal title is one that has wider application to all forest dependent communities in British Columbia. Contractor sustainability, the goal of the Truck Loggers, would be on a much stronger foundation under local sustainable trusts than under the present arrangements. The regular or serious hiker needs good robust footwear. While the last 50 years has seen some technical advances in shoes particularly the soles of running shoes, quality of construction and durability of shoes has taken a nosedive. I can recommend a product that combines the best of new sole technology with a quality of upper seldom available in the last half century. Lowa Renegades come in a hiking shoe or a hiking boot. To get top quality hiking footwear, you usually have to settle for a European hiking boot because hiking shoes often tend to be less durable. Lowa hiking shoes do not compromise on the quality or durability of construction of the hiking boot. We have been using a men's leather lined pair of Lowa renegade shoes and a women's synthetic lined pair. After 3 500 kilometers of use, the soles are showing a little wear but will probably provide another 3 500 kilometers of use before the tread is completely worn. The Men's pair have a Vibram sole and the women's are not. However the women's pair seems to equally durable and showing less wear. The synthetic lining of the women's pair wore through at the heel, but this was easily repaired with a leather insert. The leather lining of the men's pair is not showing any wear. You might expect leather lining to be too warm in hot weather. However, it is in hot weather that leather lining is an advantage. Leather absorbs moisture and does not become wet, like synthetic linings. The feet stay free of blisters. After 3 500 kilometers, other quality European hiking boots often show heavy creasing at the flex points in the upper. The Lowa renegades are not showing creasing and the stitching is intact and new looking. Winters in coastal British Columbia are wet and the constant wetting and drying of shoes tend to be hard on leather. Lowa seems to be using good quality leather. Leather hiking shoes need regular maintenance with polish or shoe cream. Salt from sweat is harmful to leather. In the fall, I soak the shoes in lukewarm water for an hour to remove accumulated salt. Dry the shoes and follow up with a leather conditioner, a waterproofing agent, and polish or cream in that order. This restores the flexibility to the leather. Sole of some hiking shoes loose their integrity much before 3 500 kilometers. The material commonly employed in the mid-sole of running or hiking shoes is EVA or ethylene vinyl acetate. This material tends to compress and the sole looses its integrity. It becomes floppy and you can feel every projecting rock in the trail. The better quality and more durable hiking shoes and boots use polyurethane in the mid-sole and it stands up to much more use. Lowa Renegades have a polyurethane mid-sole and a different method is used to wrap the sole to the upper. This makes for a light and stable sole.